The security "WOMI" has been now suspended. For more details please find the attached letter. 2074000 Units IPO of Asha Laghubitta Bittiya Sanstha Ltd has been listed. 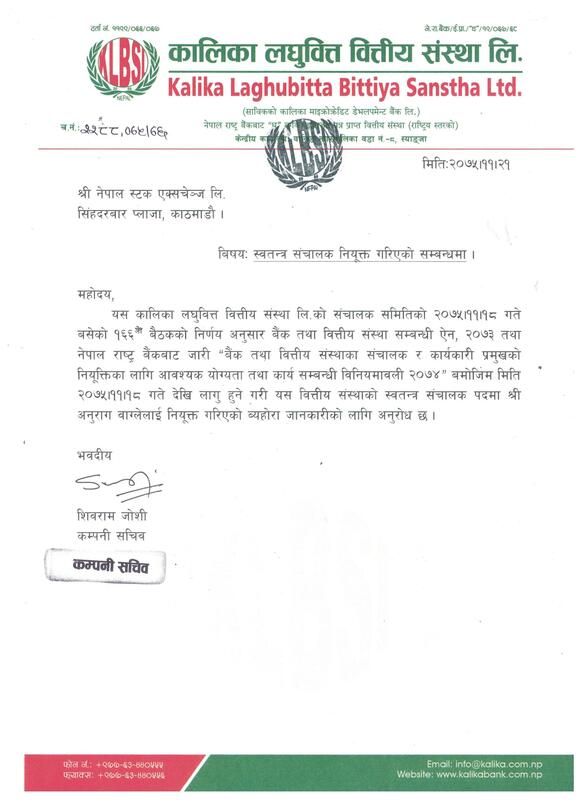 ICRA NEPAL has informed Nepse on 2075-11-23 about Rating . For detail information please find the attachment. Listing of Bonus Shares of Central Finance Co. Ltd.
News Title Listing of Bonus Shares of Central Finance Co. Ltd.
663846 Units Bonus Shares of Central Finance Co. Ltd. has been listed. News Title Listing of Bonus Shares of Saptakoshi Development Bank Ltd.
152553 Units Bonus Shares of Saptakoshi Development Bank Ltd. has been listed. Adjusted price for ALICL is Rs.375 for 60% of Rights Share. Its Average Base Price is Rs. 615.50. Appointment of Director in Siddhartha Insurance Ltd.
News Title Appointment of Director in Siddhartha Insurance Ltd. Please see the attached letter for detail information. Adjusted price for LICN is Rs.1432.14 for 12% of Bonus Share. Its Average Base Price is Rs. 2103.57. Appointment of Independent Director in Lumbini Bikas Bank Ltd.
News Title Appointment of Independent Director in Lumbini Bikas Bank Ltd.
Lumbini Bikas Bank Ltd. has informed NEPSE on 2075-11-21 about appointment of Independent Director . For more details please find the company's attached letter. Listing of Bonus Shares of Mega Bank Nepal Ltd.
News Title Listing of Bonus Shares of Mega Bank Nepal Ltd.
1030948.75 Units Bonus Shares of Mega Bank Nepal Ltd. has been listed. Dividend of Nepal Life Insurance Co. Ltd.
News Title Dividend of Nepal Life Insurance Co. Ltd.
News Title Appointment of Chairman in Lumbini Bikas Bank Ltd.
Lumbini Bikas Bank Ltd.has informed NEPSE on 2075-11-19 about the appointment of Chairman. For more details, please visit our website and find the company's letter. Rastriya Beema Company Limited has informed NEPSE on 2075-11-19 about the appointment of BOD Member . For more details, please visit our website and find the company's letter. Kalika power Company Ltd has informed NEPSE on 2075-11-17 about AGM and Book Closure. For more details please find the company's letter.